1. If not already installed, download and install Oracle JDK or OpenJDK 7 (or 8). 2. Download the JBoss Developer Studio installer. Installation can also be scripted. 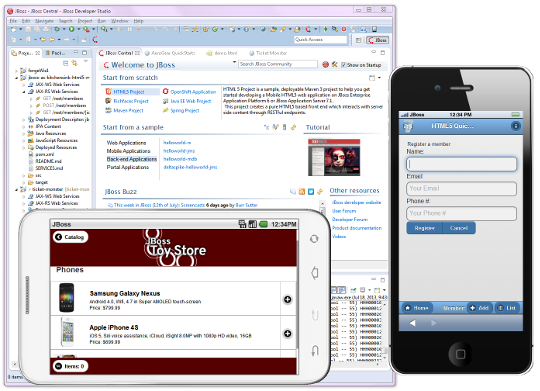 JBoss Developer Studio 8 can be installed on Microsoft Windows, OS X, and many Linux distributions. Oracle JDK or OpenJDK 7 (or 8) is required. Details here. Red Hat JBoss Enterprise Application Platform is available now. Click here for more information or to download your copy today! This site contains the latest Stable Release updates for JBoss Developer Studio 8.x. If you do not already have a copy of JBoss Developer Studio, click here to download it free. To install Third Party Extensions & Tools, previously located on the JBoss Developer Studio Extras site, launch JBoss Central and select the Software/Update tab. JBoss Central is an update site from a user can resolve all upstream dependencies of a Red Hat JBoss Developer Studio JBoss Central connector via a single URL. 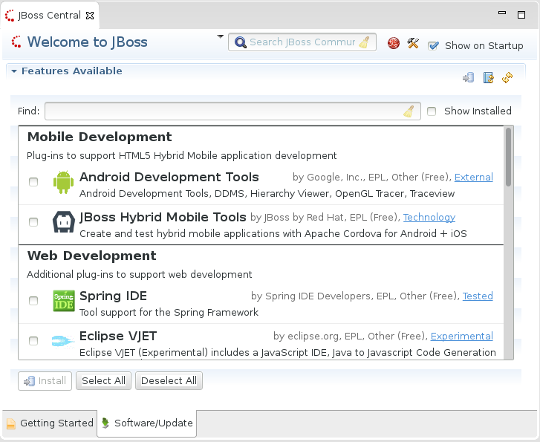 Simply launch JBoss Developer Studio, open JBoss Central, then select the Software/Update tab to explore this site for installable connectors. These plug-ins are hosted by Red Hat, tested by Red Hat to ensure compatibility with JBoss Developer Studio, and supported by Red Hat. These plug-ins are hosted by Red Hat and tested by Red Hat, but support is most likely provided by another vendor. Red Hat attempts to report issues to providers as required, should any arise. These plug-ins are tested by Red Hat, often with documentation describing known issues. The expectation is that these technology preview plug-ins may one day evolve sufficiently to be considered Tested or Supported, but this is not guaranteed. These are experimental plug-ins. It is possible that their content may change at any time and without prior notice. Red Hat provides early access to this content so that it can be evaluated + monitored, in order to execute appropriate tests + report issues to plug-in providers as required. May evolve into Technology Preview content, but this is not guaranteed. These plug-ins are tested by Red Hat but, as the plug-ins are hosted by external third party providers, it is possible that content may change at any time and without prior notice. Red Hat attempts to monitor the associated third party sites and execute appropriate tests on plug-ins, reporting issues to plug-in providers as required. How do I start Eclipse?